The Commissioner for Human Rights Policy and Humanitarian Aid of the Federal Republic of Germany Markus Loening announced that “Germany will be at your side” when he visited the Philippines on January 21-24, 2011. Commissioner Loening acknowledged the strong political commitment to the human rights efforts of the Aquino Administration. “We see that the new government is serious about human rights. We consider the Philippines a champion of human rights, and Germany will always be willing to work closely with countries such as yours that have their own impulse to reform their human rights situation,” said Commissioner Loening. He noted that the Philippines played an important role in the discussion of human rights trafficking in Geneva, and that it is a leader in the Association of South East Asian Nations (ASEAN). He mentioned that the Philippines and Germany share the same set of values where he cited death penalty as an example of the similar “fight” the two countries confront with. Commissioner Loening was also a speaker at a forum organized by the Ateneo Human Rights Center (AHRC) and the Friedrich Naumann Foundation for Liberty (FNF) on 21 January 2011 where “Human Rights and Freedom of Expression in a Globalized World” was discussed. He recognized the Philippines as a defender of freedom of speech. “Keep the flag up. Show that a society can develop with people speaking their mind,” he encouraged. Commission on Human Rights (CHR) Chairperson Loretta Ann Rosales, who was also present at the forum, expressed optimistism on the human rights situation in the country. She articulated the strategic plan of the commission. “We hope to revitalize and strengthen the core mandate of the institution by building infrastructures to develop CHR to become an effective and comprehensive monitor,” she shared. In addition to becoming a comprehensive monitor, she confidently said that President Aquino made the passage of the Charter that aims to enhance the prosecutorial role of CHR, a priority bill. If passed, the commission will have a Residual Prosecutorial Powers — assuming prosecutorial powers if the Department of Justice fails to solve cases within three months. Though still debatable, this will give the commission enough “teeth” in solving human rights issues in the country. AHRC Executive Director Atty. Carlos Medina emphasized the need to maximize the exercise of freedom of speech. “Free speech gives a sense of human dignity. It has a social impact especially when we use it to participate in political exercise. It will make the government more responsive, responsible, and accountable. We are even more fortunate now because we have a government that listens.” He challenged everyone to join CHR in its efforts to become an effective and comprehensive monitor. “A multi-sectoral approach is important to address human rights violations,” he stressed. Atty. Medina also thanked FNF which, he said, has become the channel for Germany’s support to human rights efforts in the country and in the ASEAN through AHRC and the Working Group for an ASEAN Human Rights Mechanism. Mr. Jules Maaten, FNF Country Director, is proud to have hosted the dialogue between Commissioner Loening and CHR Chair Rosales. “I am happy that Markus Loening visited the Philippines. 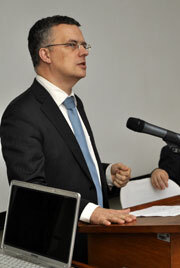 He is a liberal who is eager to stick out his neck for human rights for Germany and abroad,” said Mr. Maaten. FNF is a German liberal foundation. It works with organizations such as AHRC to further liberal principles such as participatory democracy, human rights and the rule of law, and market economy. It is celebrating its 25th anniversary in the Philippines this year.